It is inevitable with food television that you’ll excitedly watch a show, mentally bookmark all of the dishes you want to make, only to forget all about them the moment you get up from the sofa. I’m guilty of this on so many occasions. This very sad fact is why I think I should make more of a conscious effort to buy the books that accompany the shows I’ve really enjoyed: not just to rectify missing out on all of that food that has been brought to life on camera, but because experience tells me this is a very good idea. After buying the book, I think I’ve cooked (and re-cooked) more from Simply Nigella than any other book this year, and after reading Rick Stein’s From Venice To Istanbul, I honestly don’t understand why it took me so long to get a copy; there are simply so many unique recipes and flavour pairings I’ve never seen before I want to try. The first recipe that jumped out at me was the Oven-roasted Chicken with Sumac, Pomegranate Molasses, Chilli & Sesame Seeds from Turkey. 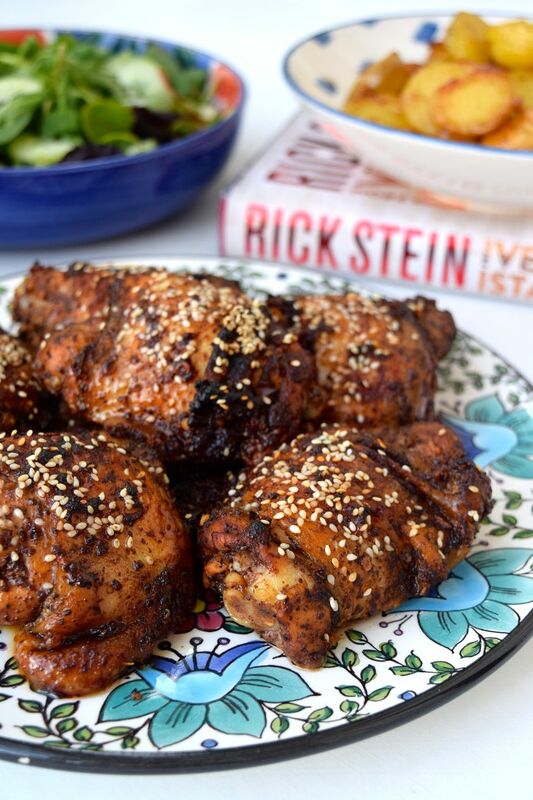 Funnily enough, it was the one recipe Rick Stein had flagged in his introduction to the chapter as what he predicted to end up as the most popular dish in the book. For me (aside from the picture looking amazing) it just screamed of all of my favourite things to cook with (that I also already had in abundance in my kitchen): skin on, bone in chicken pieces, sumac, pomegranate molasses and garlic. In my family we’re all thigh people, so I made the recipe with 6 chicken thighs (two each) rather than the jointed whole chicken called for; I just knew if I’d done that there would have been arguments over who got what. The marinade took all of five minutes, and I learnt something along the way; I always make my marinades with a bit of oil in, but I thought this one where you only drizzled it over the chicken just before roasting helped the flavours sick better. The wonderful thing about cooking in an Aga is the smell that hits you when you open the oven door to check on things. From the moment I went to take a peep everyone in the kitchen was hungry, and I think that contributed to the speed in which the slightly tart (from the sumac and molasses), very savoury thighs were polished off once they hit the table. I already know they’ll become a family favourite. To go with the chicken, we needed a side. 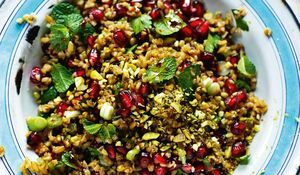 While the Kisir bulgar wheat salad from the Mezze section and the pomegranate and pistachio studded Freekeh Salad from the sides were calling to me, there was someone at the table who is known to turn their nose up at even the slightest mention of a grain. 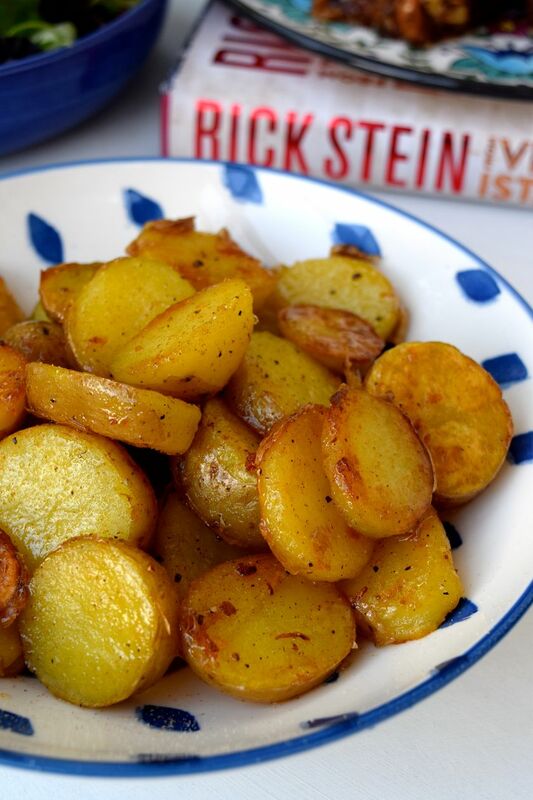 So, I thought Bandits Joy, an Albanian potato recipe that would help me stick to the ‘meat, potatoes and veg’ formula would be interesting to try; have you ever had potatoes fried in butter before being anointed in lemon juice, freshly grated nutmeg and honey before? Going for the bracketed suggestion of regular potatoes (my fussy eater also wouldn’t eat the sweet potatoes primarily called for), they were very quick to knock together while the chicken was roasting and I made a simple green salad. They were certainly unusual made with a fragrant local honey, and worked very well with the chicken in spite of having different origins. 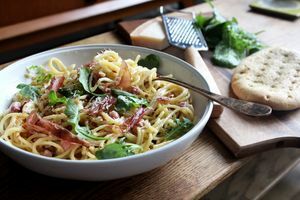 I don’t know when I’ll be making them again, but they’re a handy recipe, the sort you’re always looking for in the back of a book when you’re planning a feast and you need something with complimentary flavours for the table. 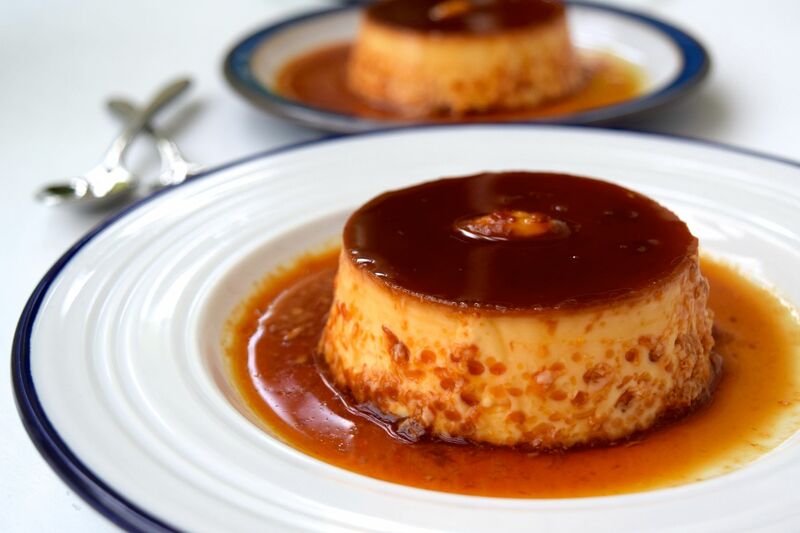 For dessert, another dish that jumped out at me was Rožata, a Croatian custard those of us from Western Europe would call a crème caramel perfumed with rosewater and orange zest, studded with a single blanched almond. Now, I’d never made any form of set custard like this. 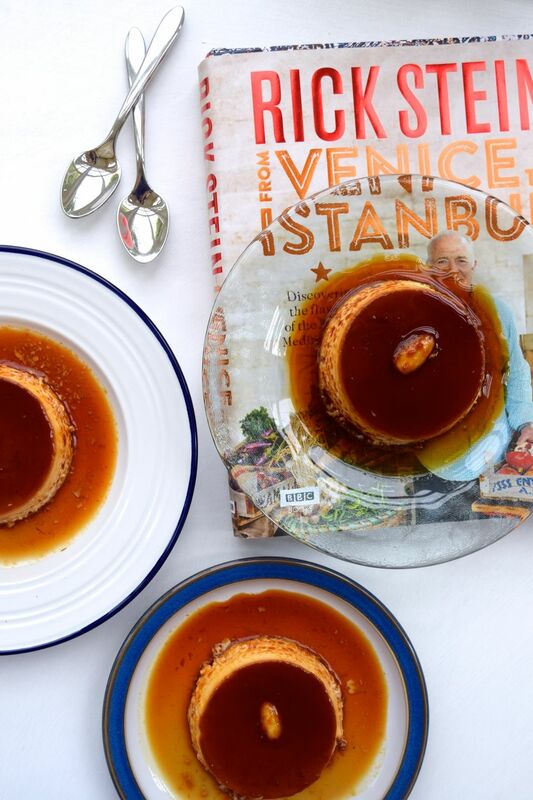 I had experience making the custard itself for a bread pudding, and the only time I’d ever tried to make caramel was with the addition of double cream. I ploughed straight in none the less, and following the instructions I made a perfectly presentable trio of custards which were absolutely delicious, albeit a little hard to turn out from the ramekins. With a little practice, I think I could make a better caramel where I won’t be leaving a bit behind still stuck to the pot, and I could get the custard smoother with less air bubbles. All that said, for a first time, I’m more than proud of the result. There is so much more I want to cook from this book, with or without slight adaptations to suit fussy eaters (I was impressed how the dishes were adaptable without losing their spirit). The Baked Pumpkin with Sun-dried Tomato Paste and Crispy Onions will be perfect in the Autumn when the vegetable patch is heaving, the Salad of Chickpeas with Coriander, Tomato & Red Onion has me curious about the addition of fish sauce, and the Griddled Mackerel in a Baguette will be perfect on the barbecue. To see more from Rachel, check out her blog, follow her on Twitter, be inspired by her Pinterest boards or go and browse her gorgeous Instagram feed. 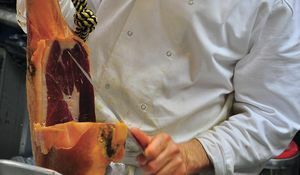 London's foremost experts on Spanish cuisine choose their five favourite tapas bars in Barcelona. If you're planning a visit to that great city, this is one guide you need to guarantee a foodie trip to remember. 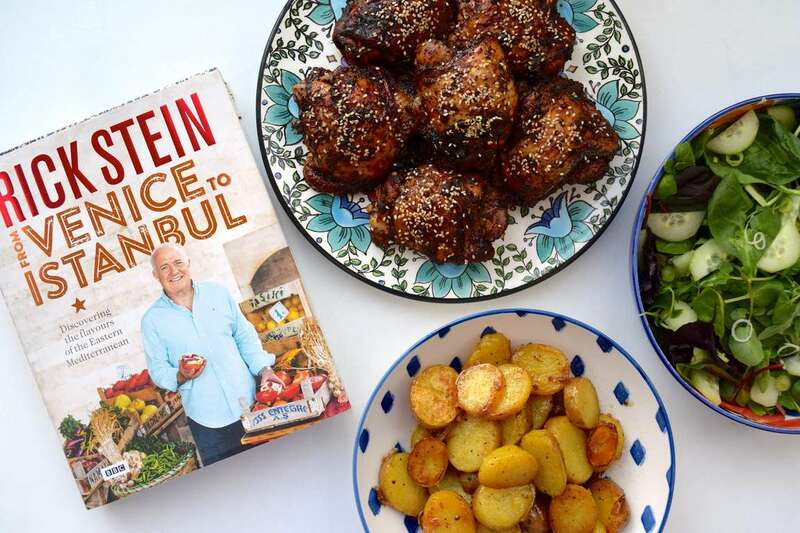 The Happy Foodie HQ has been indulging some serious Cravings cooking from Chrissy Teigen's new cookbook. Find out how we got on. Celebrity fitness trainer, Dalton Wong, and journalist, Kate Faithfull-Williams, show us how to have a feelgood lunch every day with their guide to the perfect salad.